Last time, I dove a bit into word etymologies and such, attempting to dig up insight by dissecting the meanings of brewing words. “Malt” was the major focus, and I built (or attempted to build) a case for it referring to sourdough or some kind of sour grain processing. Now let’s look at how I might be wrong. At least a little bit. Pliny the Elder was a Roman author and philosopher who wrote what is quite possibly the most comprehensive compilation of knowledge from ancient Rome – Naturalis Historia. The work covers numerous subjects in varying levels of detail; it’s an invaluable resource for gaining insight into the knowledge and practices of the ancient world. And luckily for us, it’s available for free on the Internet. There are several chapters with which I will concern myself, but I’m going to zoom in on one chapter (well, OK, a couple) in particular: barley processing. In any event, the processing of “polenta” is quite interesting. Barley is soaked in water, then tipped out and allowed to dry for a day. Once it’s dried out a bit, it’s then “tostum” – often translated as “parched” or “toasted,” but clearly meaning a direct heat application – and then ground. Why go through all this trouble? Well, Pliny talks about that too when he extols the many health benefits and remedies associated with consuming polenta, barley-meal, ptisan (a sort of porridge), and a host of other things. In particular, Pliny remarks that polenta is “more wholesome for the stomach,” indicating an ease of digestion. Throughout the book, many different methods of preparing grains are noted, and many follow that similar pattern: steep grains, dry in the sun, “parch,” grind, add stuff, and cook. He documents the methods of grain processing among other cultures, and the story is very similar. In addition to the alleged digestive benefits, Pliny also indicates that these various methods of processing were excellent methods of removing the husk from the grain. So, in addition to aiding digestion, this water-steeping/drying process also de-husked the barley, making it fit for human consumption by conversion to porridge or bread. Does all of this sound somewhat familiar? It should. Pliny is essentially describing a truncated, inefficient malting process. As you will remember, unmalted barley contains all the enzymes and RNA necessary to re-start germination, and many of the enzymes that we manipulate during the mash are active 24 – 48 hours after soaking with water. In modern malting, we steep the grain, dump it into heaps on the floor, and allow it to begin germination (in essence). Pliny describes much the same thing, except that the intent was to dry and preserve the grain. His method for processing polenta also includes a “parching” step, not unlike the kilning that happens in modern malting. Now, it’s worth noting that Pliny’s method is very, very short. It generally takes 10 – 12 days to properly malt a modern grain; his method seems to take no more than 48 hours. Still, it’s probably enough to stimulate enzyme activity – and the follow-up kilning may act as a mash, allowing the enzymes to convert the complex macromolecules. If we further assume that the “parching” to which he refers was low-temperature (and this is probably the case, as he specifically mentions that other people “parch more highly” – or heat at a higher temperature), then it’s probable that the grain will retain some distatic power. When that grain is subsequently used to make porridges or what have you, the heating will effectively work like a mash, finishing the conversion and breaking the complex nutrients into easily-digested sugars and proteins. 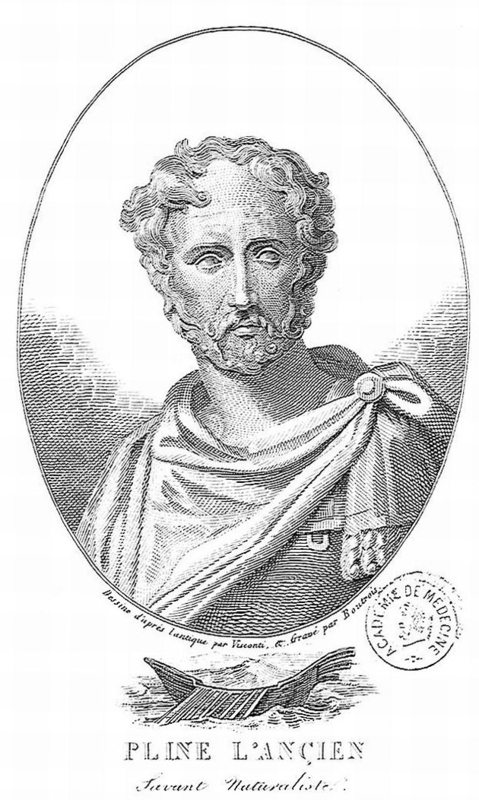 It is therefore likely that Pliny’s reference to the processing of “polenta” and other cereal grains – primarily to remove the chaff – incidentally resulted in low-efficiency malting. This technique would have been carried to Roman Britain, where it would have been taught to the locals – which may serve to explain the migration of the technology. Perhaps when the same thing was attempted in the cooler, moister environment in the Orkneys, the grain didn’t dry as quickly, and wound up sprouting slightly. Grain processors would have discovered that the resultant grain made a sweeter liquid, and this would have become the desirable method of grain processing. Or, in other words – Pliny’s techniques are the common ancestor of modern malting, which was not fully realized until the technology was brought farther north into a different set of environmental conditions. The technique spread back down, and modern malt processing was born – signaling a fundamental shift in brewing methodology. And thus, we see how the Romans accidentally invented malting. Well, OK – they took credit for it. It’s quite possible that Pliny’s technique may have resulted in some slight souring, especially if the ground polenta was re-wetted and allowed to dry in the sun, as he suggests. I also find it very interesting that all of the various cereal preparations he mentions have some kind of spice or herbal addition; he mentions adding “coriander” at a rate of 2.2% to the polenta (it’s unclear if he means coriander seed or coriander leaf, since the same word is used for both in Europe), and other processing methods have other additives – such as chalk. Pliny also mentions various “remedies” that make use of these processed grain products – many of which are added to wines or “hydromel” (the Latin word for mead). This is extraordinarily similar to the Hymn to Ninkasi process and the aforementioned 16th-century bread-beer. It seems to me that this addition of herbs to the prepared meal could provide an explanation for the origin of the use of “gruit” in Anglo-Saxon brewing. Further, the addition of these herbs likely changes the flavor profile of the grain – perhaps making it “bitter” or “sour” as the original meanings of “mealt” and “maltr” may indicate. It’s also worth noting that “mealt” has a connotation of boiling or stewing – the sort of thing you do when making porridge. Next time, I’ll explore the meaning of “gruit,” “wyrt,” “ealu,” and other Anglo-Saxon brewing words, in an attempt to figure out just what the hell “ale” might have been 1500 years ago. It occurred to me at one point during this research that I didn’t know the origin of the word “malt,” or its true meaning in-period. I had a vague idea that it was probably taken from proto-Germanic, like much of our language, but the specifics eluded me. The Icelandic sagas contain many references to malt, but no saga relates its method of production. We can infer from many of the tales that malt was a grain product processed separately from other grains – they also have words for flour, corn, and the individual grains themselves. We’re also fairly confident that malt was used to make ale, although there is no recorded recipe for doing so in the corpus of Viking literature. Many contain references to the use of malt in the making of ale – some of these are compiled here. In each and every world?” There are many names given – all different types of drink. If there’s ambiguity in the exact use of the word “ale” – or even its core concept in the Viking age – it stands to reason that there may be ingredient ambiguity. Indeed, when examining the etymology of the word “malt,” we find that it first appears in its contextual usage in Old English, where it’s “mealt.” The meaning is pegged to be “melted,” and it is presumed to be related to steeping in water – a critical part of the production of modern malt. It’s possible that these alternate meanings impact our concept of “malt” in the Anglo-Saxon and Viking era. The Kalevala contains a passage where beer is brewed by boiling unmalted barley, and I’ve demonstrated a 16th century “beer” whose grain base is sourdough bread – which may be connected to very ancient brewing. And of course, let’s not forget that delicious Russian beverage, kvass. The word “kvass” is first documented in the Primary Chronicle of Russia, in 989. The word is квас, which means “sour” in Old Russian. The word is used in a passage describing gifts given to peasants – food, water, and “kvass.” This is obviously some kind of gift separate from the other two concepts; tradition shows that “kvass” is a lactic-fermented drink made with bread or bread and honey. Interesting. 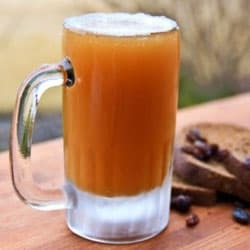 “Malt” comes from a series of words whose meaning includes “sour.” “Kvass,” a drink made of bread, originally means “sour” in its contextual use. Kvasir is a Viking character who is slain, and whose blood forms the basis for the mead of poetry. Word meanings are rarely cut-and-dry, and analyzing the origins of our words can give us insight into historical practices. I find myself beginning to wonder about early medieval ales; they seem less likely to map to our more modern concepts of fermented cereal beverages. My working hypothesis is that early medieval “ale” represents a class of beverage designed to give fast nutrition. The grains were likely processed into sourdough of some sort before being used in the drink, and other sugar sources may have been used in addition. These same ingredients could be used to make higher-alcohol beverages as well. A while ago, I stumbled across a book called A Description of the Northern Peoples, written by the Swedish Catholic archbishop Olaus Magnus in 1555. The original Latin text is freely available online; I have an English translation published later. 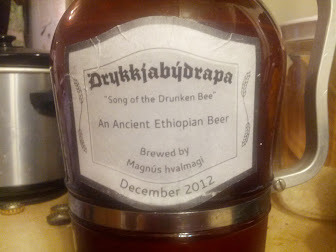 In the book, Magnus documents “a method of brewing beer among the Ethiopians or Indians.” It’s worth noting that, in the 16th century, “Ethiopia” was a word used to refer to all of Africa and a chunk of the Middle East; this recipe is not strictly limited to the modern borders of Ethiopia. The recipe is found in Book 13, chapters 30 (in part, to make the bread) and 31. Following are excerpts that convey the recipe. I’ve made the recipe twice so far. “Take biscuit bread and sprouting barley and put these into a large jar just as I described above, until the third day. Then take a big pot full of honey together with the combs and wax. Afterwards take a large vessel which will hold five times as much liquid as the pot held honey, and wash it thoroughly. While it is still damp turn it with the mouth downwards, to be smoked over dried olive leaves. Next pour in all the honey from the pot, fill the same pot twice with sprouting barley and softened biscuit bread, and put as much water and sprouting barley as you need into the vessel you poured the honey into. He wrote a lot more than that about the beer, but those two excerpts are the bulk of the actual technique. He describes the process for sprouting the barley, extracting wax from the “scum” skimmed off, and talks about the importance of keeping beer away from menstruating women and people “polluted from recent coition. 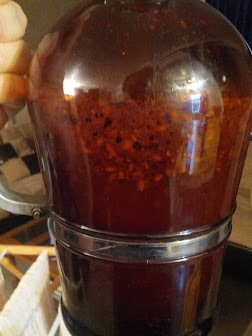 I decided to take a crack at replicating this recipe, because the technique is unlike anything else I’ve seen. It somewhat resembles the process documented in the Hymn to Ninkasi – but that’s a topic for another time. I should have used stone-ground flour for this one, with a varied consistency – but I didn’t have access to it. I used whole-wheat flour the first time, and used my barley crusher to make a coarse barley meal the second time. The “bread” that results from the wheat is pretty interesting. I’ve never let a sourdough go for 10 days; by the end, the dough was the consistency of wet clay, and baked into something not unlike pottery shards. It was also extremely lactic – it tasted quite a bit like a sharp Italian cheese, similar to aged provolone. 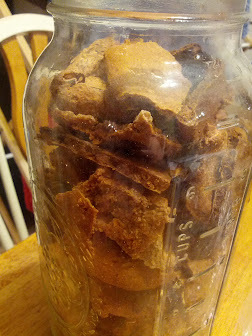 The barley bread wasn’t much better – still very hard and dry, but it crumbled more easily than the wheat bread. The process past the baking is pretty straightforward – soften the bread, mix the bread glop with raw honey (with combs and wax), and drink a few days later. The smoking step is curious at first glance, but olive leaves contain bacteriocidal compounds, so the smoking likely served as some form of sanitation. The stuff is quite sweet after 3 days, with a strong honey flavor, a nutty breadlike flavor, a touch of lactic sour/tartness, and a very yeasty profile. It’s not unpalatable – it’s just bizarre. 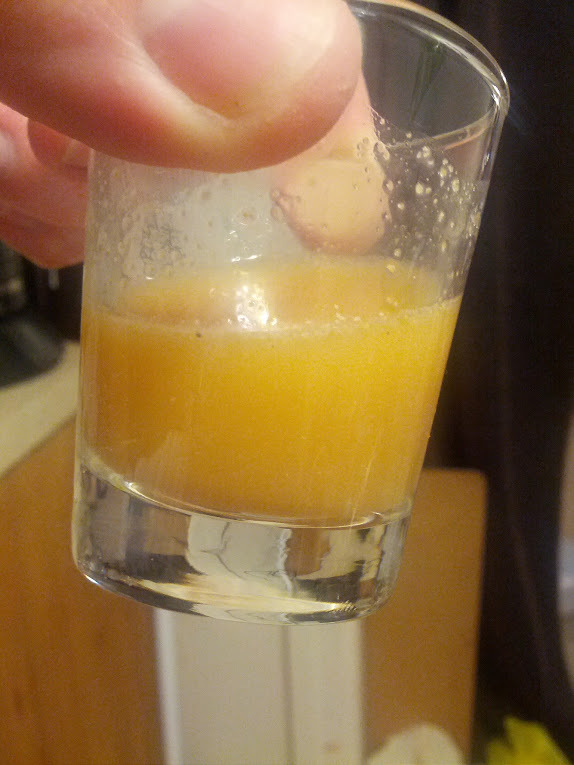 Very mildly alcoholic, though it gets stronger as it ferments longer. 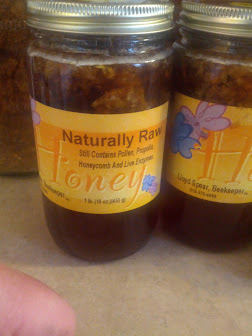 When I finished the first iteration, I found a dead bee in the solids – that’s what I get for using raw honey with comb. My friend Fridrikr Tommasson (mka Tom Delfs) helped me name the drink, in honor of the bee’s noble sacrifice: “Drykkjabýdrapa,” or “The Song of the Drunken Bee.” Godspeed, little friend. I can’t really map it to any modern beverage, and I’m not even sure it was really intended as a “beer” in the way we think of beer. It doesn’t seem like the fermentation is really intended to produce alcohol; rather, it seems to me that the fermentation makes the stuff easier to drink. It’s very thick and rich, rather like a liquid bread. I suspect it may have been intended primarily as a nutrient beverage – a way to make use of the grain that was processed for long-term storage. It’s even conceivable that the yeast content may provide B-vitamins, enhancing the possible nutritive qualities. This is the recipe that made me start thinking about the potential use of sourdough bread in brewing. Could something like this be reflected earlier in history? What does the sourdough process actually contribute to the beer – since it’s such an obvious specialized processing technique, it stands to reason that the brewers were attempting to manipulate the grains to a particular end. That is a topic for a different post.